← Hats Off To Ralph Peters! Good People Doing Good Things – The People of Puerto Rico! Yesterday marked the six-month anniversary of the day Hurricane Maria tore through Puerto Rico, leaving behind devastation and death. Hurricane Maria made landfall at 6:15am on September 20 in Yabucoa, in southeastern Puerto Rico, as a Category 4 storm with winds of 155mph. The island suffered significant structural damage and widespread loss of power and communications. Power and communications are only beginning to be restored. COMERIO, Puerto Rico — I live with my parents and older brother in this rural mountain town in the center of this island. Hurricane Maria made landfall here six months ago this week. The strong winds began to lash our area by 2 a.m. on Sept. 20. Our power and water had already been shut off for a day by then. My family, along with about 200 other people, sought refuge at a high school in our town. Whenever the doors were opened to let others in, the wind would whip through the hallways. I was scared. A few of us gathered in a circle, joined hands and prayed, hoping it would bring us some sense of peace. Then chaos broke out. The Plata River, which cuts through Comerio, had swelled by more than 60 feet and was creeping ever closer to the school’s front door. Fearing the worst, those of us sheltered on the first floor quickly scrambled up the stairs to the second floor, carrying the bedridden elderly with us. In the end we were spared. Once the eye of the storm settled over us, things calmed down. Soon from the second floor we saw whole families walking toward the school. In all, about 100 more people arrived; wet, muddy, hugging one another and crying. A mother whose house had flooded told us how she and her kids narrowly avoided drowning. She had lifted her three children — all under the age of 5 — on to her shoulders and waded through the water until she reached higher ground. A woman fainted when she recounted how floodwaters had swept her house away. On the second night we were finally able to go home. It was pitch black and raining. Our terrace roof was gone; a tree that had fallen on the back of the house caused some structural damage, and water had come in through the windows. But our home, built of concrete, still stood. We were among the lucky ones. Three days after Maria hit, the streets were still largely impassable. We set out on foot to the very river that was our source of terror during the storm, checking in on neighbors along the way. There was no electricity and no running water, so the river was now our sole source of water. We bathed in it, washed our clothes and dishes on its banks and carried back home as much of it as we could manage to boil for drinking and cooking. It would be two weeks before the town supermarket reopened, and two more months before we could use our credit cards to shop there. We ran out of cash. The local bank remained closed until the end of November. Gas was scarce. Before the hurricane, I was working toward a master’s degree in management and leadership at the University of Turabo. My studies were put on hold. When the university reopened in October, I had to go to neighboring towns that had power to contact my professors and my classmates, or to work on my assignments. Everything became complicated. For about two weeks we didn’t know if my older sister, Maran — who lives in Fajardo, a city in the eastern region of the island — had survived. She finally heard that the street to Comerio was clear and made her way to us. My dad screamed when he saw her. We all gathered around her, crying and hugging. Since then, little has improved much. There’s so much left to do. We’re still fighting to get our lights back on. The local government hasn’t come to meet with our neighborhood or give us updates. We’re getting by with a generator my uncle on the mainland sent us. Other family members and friends have brought us much-needed water filters, batteries, food and tarps. 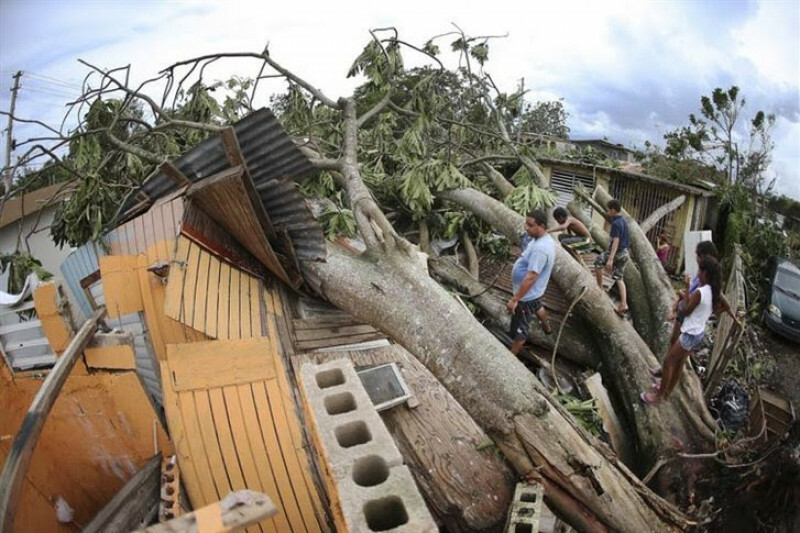 In total, some 1,500 homes in Comerio were destroyed and 2,400 others sustained significant damage. I began to volunteer with the recovery effort. We’re in this together and we’re all pitching in to help one another rebuild. 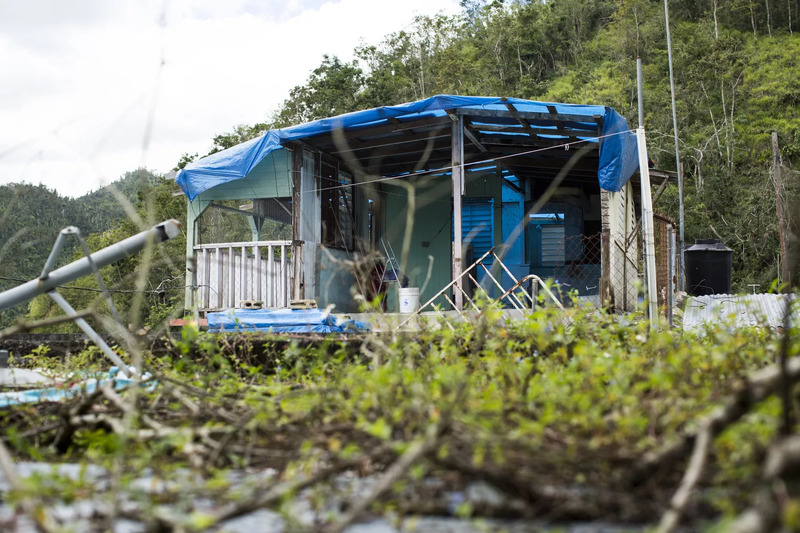 With $10,000 raised through crowdfunding and $5,000 from the Defend Puerto Rico Hurricane Relief Fund, we rebuilt one house and repaired two others with damaged roofs. With the help of Coco de Oro and La Maraña, the organizations I volunteer with, we have raised money to begin work on the next eight houses. But there are 25 more houses in my neighborhood alone needing work and thousands more in all of Puerto Rico. We’re working collectively to lift ourselves out of this nightmare, but we can’t do it on our own. I struggle to understand why the United States government continues to withhold the aid we were promised. We’re tired of being treated like second-class citizens. The Trump administration must honor its commitment to Puerto Rico. Our hurricane-ravaged island may no longer be in the headlines, but we’re still suffering, and we need help. Mariangelie’s is not the only such story, and she is far from the only one volunteering, helping get the island and its people back to normal. 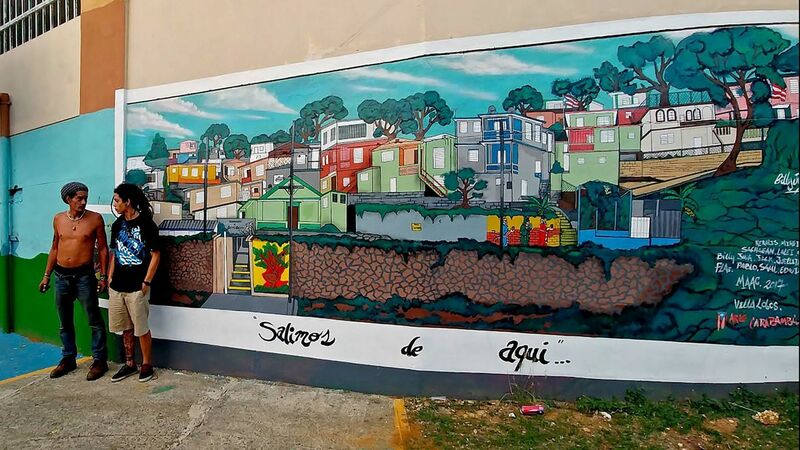 When Aguadilla artisan and painter Jenny Cruz heard of the efforts to bring art to the neighborhood, she pledged to help provide paint for the murals. Cruz, 46, was also busy trying to find a home for a friend who she learned was sleeping under the bleachers of a basketball court in the nearby town of Rincon. Orlando “San” Gonzalez, a boxing coach with a reputation for taking in the toughest kids in the Cerro Calero neighborhood, decided to form a fighters brigade to help the elderly clean and rebuild their homes. Gonzalez, 48, and his friend, businessman Gabo Sola, 31, and other professionals and volunteers help people in need, especially those who are most frail, through a nonprofit group called “We Are One.” Gonzalez’ 22-year-old son, boxer Orlando “Capu” Gonzalez, recently returned from a fight in Kissimmee, Fla., with supplies of water and food, which were distributed in the community with help from other boxers. When the boxers heard that Aguadilla resident Irene Mendez had lost her husband, Leonardo Enchautegui Flores, in an accident days after the hurricane, they vowed to help clean debris off her yard and home. Mendez said Flores, 75, died after falling from the roof of their house while trying to fix damage by the hurricane. Medina Carrero, 59, called in to radio newscaster Victor Vazquez and told the broadcaster he and his parents were hungry. He said the roof on his parents’ home had blown off during the hurricane. He said he helps take care of his father, Maximino Medina, who is 84, and his mother, Iris Carrero, who is 79. Vazquez, 42, contacted Sola and Cruz and together they secured a week’s supply of food for the family. Vazquez also called a friend who volunteered to fix the roof and someone from the neighborhood anonymously fixed the family’s 1991 Oldsmobile, which needed a new radiator hose. The Medinas never found out who fixed the car, but it was a gesture of solidarity that brought Medina Carrero to tears. See how one thing leads to another, which leads to another? This, my friends, is how it should always work. Jorge Sanders, 32, a communications consultant and several of his compadres have banded together to provide relief to as many friends, neighbors and strangers in need as they can. 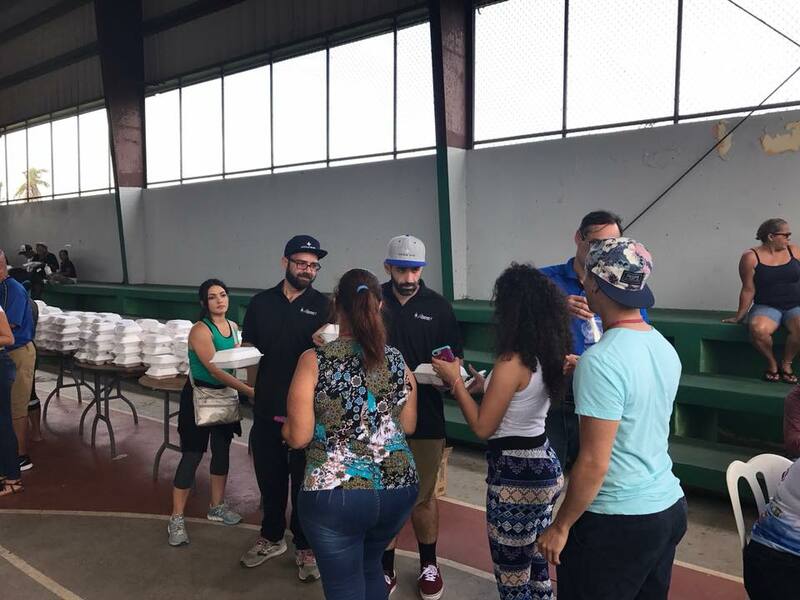 They call their initiative Jóvenes x Puerto Rico (Young People for Puerto Rico) and they have mobilized restaurants to come together to deliver food to those in need, rented trucks filled with water and ice from distribution centers in San Juan and delivered them to other municipalities. Sanders says, “There is no doubt that the reason the crisis hasn’t been worse is because Puerto Ricans have been helping out their brothers and sisters and not waiting for aid that has never come.” There are many individuals, businesses and non-profits doing what they can to help their communities get back on their feet again – far too many for me to list here. The people of Puerto Rico are good, kind people who care about their neighbors, and with or without the help of their government, they will rebuild their homes, their businesses, their towns and their island to be even stronger than before. My hat is off to the good people of Puerto Rico for your perseverance and your love of neighbors and homeland! Note to readers: If anybody would like to donate to the efforts of our fellow-Americans, I strongly recommend you contact our good friend Dr. Horty Rex (@hrexach on Twitter), for she is far more knowledgeable in this area than I. This entry was tagged 6 months later, Hurricane Maria, Jóvenes x Puerto Rico, Jorge Sanders, Juan Perez Ramos, La Maraña, Mariangelie Ortiz Ortiz, Puerto Rico, rebuilding an island. Bookmark the permalink. What a great story! I am headed there in 2 weeks to write about this beautiful resilient place. Thank you for your inspiration. Thank you! And I think it’s awesome that you are going and planning to write about it! I will look forward to reading what you write! Have a safe journey. Thanks Suzanne! Yes, our government’s response has been abominable, but it is so heartwarming to see the people just rolling up their sleeves and pulling together. Thanks for this update, Jill. I don’t know Puerto Rico well, but I vacationed in San Juan for 3 days, three years in a row. I find this all very heartbreaking. I have never been to Puerto Rico, so you are ahead of me! Yes, it is tragic, and now the big problem is that the suicide rate is on the rise … significantly. Nobody could have stopped the hurricane and the damage it did, but the aftermath could have been made so much easier, if not for the cruelty and lack of compassion in the White House. Heartbreaking. Puerto Rico is beautiful, Jill, and the people are too. It burns me up that Trump and his bootlickers were more intent on giving themselves billions in tax cuts while their fellow Americans on the island suffered. I hope that karma will be a B…. Yes, I have seen pictures (not the ones on this post, obviously) and I agree that it is beautiful! I’m with you … one way or another, I hope they all get what they deserve! Hugs!!! These events are teaching us, should we care to learn anything at all, that supporting all that top-heavy, insane and utterly selfish government and corporate hierarchy is stupid. To expect anything to come back from them makes us the insane ones. They have such a good thing going, bleeding the planet and people dry, why should they do anything to cut into their power and profits? They’ve stolen our power, or what we believed was our power, through propaganda and lies and we’ve supported them the more corrupt they got. They steal our money to fatten themselves, steal our resources to fatten their corporate and banker friends and we cheer them on. Then when we need our money and resources to take care of our own, there’s nothing. I’ve been saying it for years, come on people, wake up! Smell the rot! It’s only when something like happened to Puerto Rico do people get a glimpse of the corruption in all the high places. For Americans, the only thing that will wake them up is when someone actually brings “the endless war” right onto the mainland; when America experiences the reality of imposed ‘regime change’ from an alien invader; when the roles are reversed. Too late by then though. I find that I have no argument for anything you say. I thought we were better than this, but obviously we are not. I thought we cared about our fellow humans, but obviously we do not. I think we can turn it around and make a difference, but I’m probably wrong about that, too. And yet, I will go down fighting the fight, for to do otherwise is unacceptable to me. Sigh. Yes, the paper-towel incident was an embarrassment for us all, and proved his complete inability to comprehend the pain the residents of Puerto Rico were in. But to see that the people are pitching in … from what I read, it seems that almost everybody is doing something to help out … is so encouraging. Their lives certainly would have been made easier with more help from the federal government, but they aren’t sitting around whining about it … they’re out and doing what needs to be done. I admire that spirit! It makes Trump look even more like a wuss than he already did. There are so many heroes as depicted in your post and those we don’t know about. There are so many cruel acts that President has been guilty of, but this tops the list. I wish there was a world tribunal to condemn the president over his deliberate neglect and the republican legislators who refused to do what is right. Our treatment of our brothers and sisters in Puerto Rico has been abominable. Were it not for the ongoing saga of all things trumpian, I think the situation in Puerto Rico would have received much more media attention, and much more outrage from all of us. But isn’t it wonderful the way they are pitching in and helping each other? Hugs!!! I know. And I can feel your pain and also pride. Have you considered going to visit? AWESOME!!!! I’m so glad you are going! I want pictures!!! Won’t it be a treat to see people you haven’t seen for 50 years! I know you will have a wonderful time, but I also know there will be sadness for the way things are, and that you won’t want to leave … or maybe you will. Hard to say. Just have a great time … and send me pictures!!! Many hugs!!! No, I didn’t see your new tattoo! Have you posted it on your blog or on Twitter? Point me in the direction so I can see it! Here’s the first post about my tat … It’s on my Rt. forearm …. This is the BORICUA SPIRIT … my country!! Always in my mind, heart and soul! !